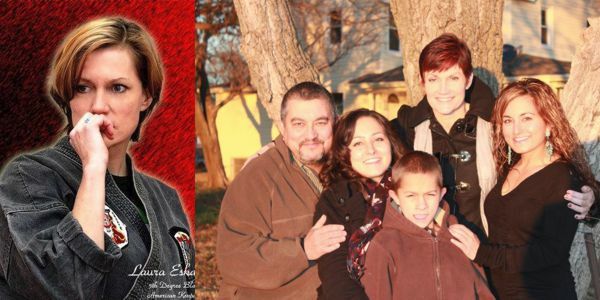 Laura Eskandarion died Monday, December 16, 2013 at her home in rural Wellington, Kansas at the age of 50. It is with a very sad heart that we share with you that Laura Eskandarion of the LB School of Self Defense has passed away. Laura passed away Monday, December 16, 2013 at her home in rural Wellington, Kansas at the age of 50. Laura Eskandarion was born the daughter of Raymond and Mary (Johnson) Graham on Thursday, February 7, 1963 in Wichita, Kansas. On February 12, 2000, Laura and Burt Eskandarion were united in marriage in Wichita, Kansas. Together they celebrated over 13 years of marriage. 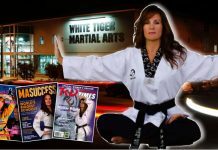 Laura worked at Boeing Aircraft in Wichita, Kansas for 11 years; however, she eventually left to pursue her lifelong dream of operating a karate school. With the support of her family, she and Burt opened the LB School of Defense in Wellington on February 16, 2008. Laura was dedicated to the school and students and considered them all a part of the family. Laura and Burt had over 44 years of combines experience in the martial arts. 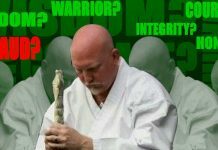 They both started their journeys into the art of American Kenpo Karate 17 years ago under the tutelage and direction of Si-Bok Tom Kelly 9th degree Black Belt in American Kenpo. 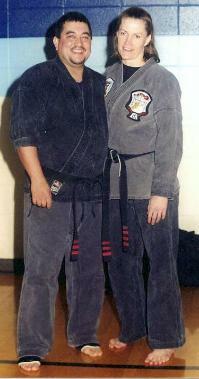 Both Laura and Burt climbed the ranks to their current position of 4th and 3rd degree Black Belts. They enjoyed a successful career in the tournament circuit with Laura placing 1st in the majority of her competition and securing numerous Grand Championships in Forms and Fighting. Laura is the only woman to be promoted to the rank of 4th degree Black Belt by Si-Bok Tom Kelly and she received her 5th degree Black Belt from Si-Bok Kelly in July, 2011. 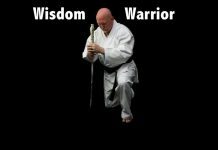 Both Laura and Bert served as senior instructors as Si-Bok Tom Kelly’s Kenpo Karate studio for over 11 years. When not at work, she loved her life on the farm. Laura enjoyed being outdoors with her cats, dogs and chickens. She especially looked forward to riding horses and hunting pheasant in South Dakota. Survivors include her husband, Burt Eskandarion of Wellington, Kansas, father, Raymond “Chub” Graham of Wichita, Kansas, daughters: Jenny Eskandarion of Baltimore, Maryland and Jessy Eskandarion of Haysville, Kansas, grandson, Braden Amir Eskandarion-Nix of Haysville, Kansas, brothers: Tim Graham and his wife Debby of Cheney, Kansas and William “Bill” Graham and his wife Robin of Mukilteo, Washington, several nieces and nephews: Cody Graham, Augustus Graham, Megan Foltz and her husband CJ, Dustin Graham and Kyle Graham along with a great-nephew, Tyler DeMott. She was preceded in death by her mother, Mary Graham and her uncle, Clemet Johnson. The family received friends at the funeral home from 6:00 p.m. to 8:00 p.m., Thursday evening, December 19, 2013. Memorial Services for Laura were held at 10:00 a.m., Friday, December 20, 2013 in the chapel of Day Funeral Home, 1030 Mission Road, Wellington, Kansas. Memorials have been established in her loving memory with MD Anderson Cancer Center Children’s Cancer Hospital, P.O. Box 4486, Houston, TX 77210-4486. Contributions can be mailed or left with the funeral home.